According to various official bodies,204,018 people were prosecuted or fined in 2014 for TV licence offences: 4,905 in Northern Ireland, compared to 12,536 in Wales and 173,044 in England. In Scotland, there were 13,486 cases disposed of via an out of court fine and 32 prosecuted via the courts in 2013-2014. Already 145 cases were open in the last 8 months in the Isle of Man. There have been no prosecutions for TV licence offences in Jersey or Guernsey in 2014. Putting these numbers in perspective, it would appear there are more prosecutions and convictions per capita in Wales than in any other country in the UK. 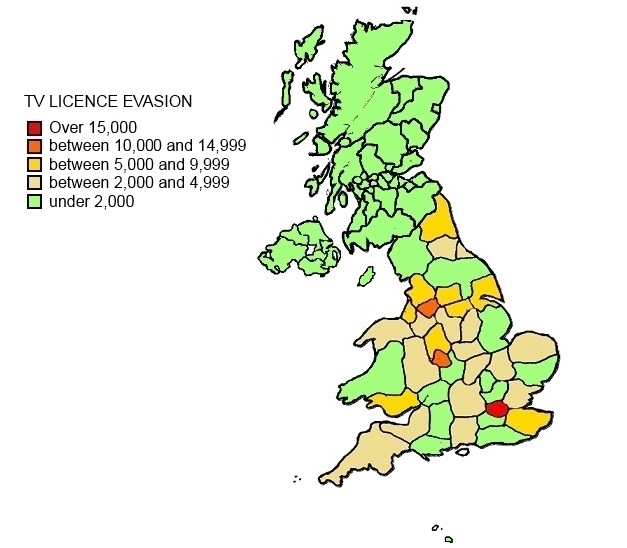 It’s also worth noting that 9 out of 10 areas with the most suspected TV licence evaders are in England, whereas 8 out of 10 areas with the least prosecution are in Scotland. If the typical TV licence evader appears to be living in England, it’s average age is hard to determine, as brackets of age supplied by various official bodies are not uniform, some covering as little as 2 years while others cover as much as 34 years. However, one thing is clear: over 70% of TV licence evaders are female. This 30%-70% male/female ratio is pretty much constant across the whole of the UK and is at odds with statistics for other small crimes (men tend to be more criminalized than women, by a long way). The BBC assures us that women are not deliberately targeted. They describe their protocol as follow: a TV Licence officer who finds a house without a valid TV licence will take a statement from any responsible person living at that address, regardless if they own the TV, watch it or are in charge of paying the household bills. Therefore, the logical explanation for the gender disparity is quite simple. Statistically, women are more likely to be at home during day time, taking care of children for example, when TV licence officers are likely to come a calling. Women might also be more trusting and willing to open the door in the first place, and willing to correct their situation when prompted. The BBC claims that, where a householder agrees to purchase a licence, it is likely that no further enforcement action will be undertaken. Unfortunately, there is strong evidence pointing to the contrary. The back of the form used by TV licence officers for example, clearly states that “Even if you purchase the appropriate licence, you may still be prosecuted for the offence.” Testimonies also back this finding that people willing to sort out their TV licence on the spot end up being the victims of this system. Interestingly, in Jersey, only 48% of the people who have been investigated for TV licence offences since 2008 are female (20 out of 41). This complete departure from the rest of the UK is certainly worth noting. In the Isle of Man, women account for 62% of prosecutions and around two-thirds of the convictions. An astonishing number of the prosecutions that are commenced by the BBC do not result in conviction. Freedom of Information Requests show that 1,188 people were wrongly prosecuted of committing a TV licence offence in Wales last year. This means a failure rate of 9.4%. In England, 21,541 were wrongly prosecuted, meaning 1 in 8 cases (12.4%) were either dropped or withdrawn by the BBC, or people were not found guilty. More worryingly, over 1 in 4 cases failed in Northern Ireland as 1,286 people were wrongly prosecuted last year. Jersey is on a par: of the 8 people prosecuted since 2008, 2 were found not guilty, meaning an equally weak 25% failure rate. Not far behind, is the Isle of Man, with a an overall 20.6% failure rate. And even though only 32 people were brought to Scottish courts, considering that 4 of them were found not guilty, it means the 12.5% failure rate in Scotland is on a par with England and Wales’ rate. In total, 24,025 people were unnecessarily brought to court last year. This number of ‘unsuccessful’ prosecutions brought lends weight to the view that cases are initiated on a speculative basis where it is hoped by the BBC that people will plead guilty or won’t contest the prosecution. This surely is a scandalous abuse of the courts’ process by the BBC. 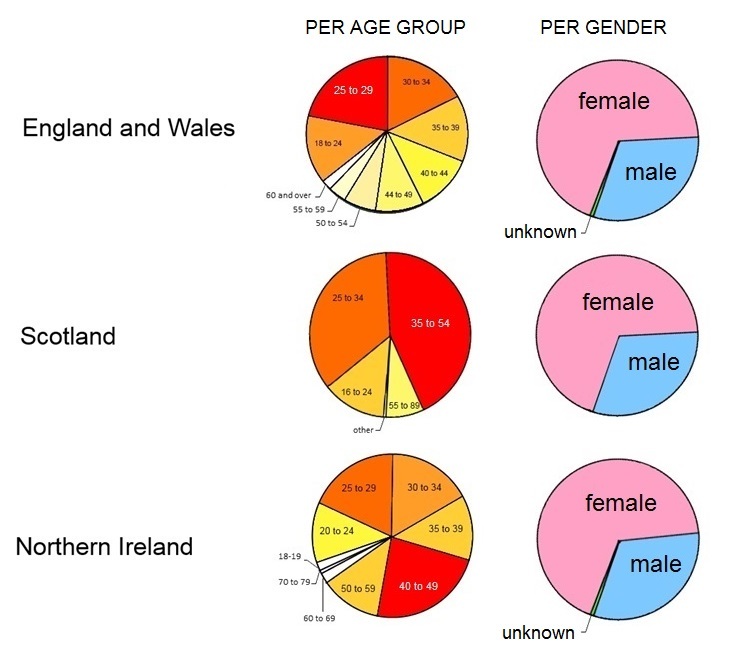 It’s interesting to know that 80% of the conviction in Northern Ireland were pronounced in the absence of any defendant. Also, some people have been prosecuted more than once in the Isle of Man: one person 4 times, six people 3 times each, 21 people twice each, showing perhaps that criminal fines have a lack of deterrent effect. Fines, at least in England and Wales, are based on the criminal’s income. In the case of TV licence evasion, it should represent between 25% and 125% of the evader’s weekly income, depending on the duration of the offence and other factors. For example, if a guilty plea is made, a reduction will apply, reflecting the stage at which it is made. The maximum fine is £1,000 (except in Jersey where it’s £500 and in Guernsey where it’s £2,000). However, the average fine is £70 in Jersey, £80 in Northern Ireland, £75 in Scotland (out-of-court disposal) and a whopping £170 in England and Wales. In the Isle of Man, the median fine was £150 until 2013. In 2015 it has been £200, though a quarter of the 2015 convictions so far have been for £300. So, for the sake of a theoretical average gain of £25 (the difference between the fine in England and Wales and the price of buying a TV licence in the first place), the BBC is happy to relentlessly chase people and press charges, which is far from free. The BBC sent, under the TV licensing trade mark, 52.8 million letters last year. These letters were followed with around 3.8 million visits by TV licence officers. But, considering that court records show that less than 35% of TV licence fines are actually recovered, it would appear that prosecuting people is a long way away from being a profitable business. Because watching TV without a TV licence is, in the eye of the law, a crime (unlike other utility bills), TV licence evaders will get a criminal record. It will not show up on basic criminal record checks. And because criminal matters are public, some local newspapers have decided to entertain their readers with what amounts to Public Shaming: a disclosure of the full name and address of the offenders, along with the amount of the fine awarded. Finally, 2 charges will be added on top of the fine: court costs (between £60 and £120) and a Victim surcharge (£20 to £60 which will fund victim services if recovered). The length of stay is decided by the amount owed. Considering that 39 people were given an average of 20 days for fine default in relation to TV licence offences in England and Wales in 2014, each stay is likely to have cost tax payers close to £2,000, bringing the combined total to an eye watering £74,000. The situation in Northern Ireland, at least up to 2012, was even more appalling with over 200 imprisonments each year. A Judicial Review led to a temporary suspension of fine defaulters being sent to prison, putting a stop to the unsustainable practice of giving jail time for non-payment of outstanding fines of as little as £5. Now, fine default warrants are apparently only being issued if the defendant is already in prison serving a sentence or if he or she lives outside the jurisdiction. Thankfully, there were no custodial sentences imposed during the 5 year period 2009-10 to 2013-14 in Scotland, which shows a great dose of common sense and progressive thinking. The same applies to Jersey, with no incarceration ordered since at least 2008. In the Isle of Man, the system in place is not sophisticated enough to ascertain whether a fine for non-payment of a TV licence ends up in a non-payment of fine and therefore a prison sentence. The British parliament proposed decriminalising the offence once and for all, but unfortunately the proposition was turned down by a House of Lords vote by 178 to 175 in February 2015. This is curious because the Lords actually recommended the offence be decriminalised in their 2005/2006 BBC Charter renewal paper. 8 aged 50 or over. Before 1991, the Home Office was in charge of the collection and enforcement of the television licence fee. The evasion rate was pegged at 12%. When the BBC took over, they went down the creepy route with adverts like “Your town, your street, your home, it’s all in our database” and they got into their heads that they had a responsibility to the households who pay their licence fee to vigorously pursuing those that deliberately evaded payment. The evasion rate went down to 5%. Studies have shown that the perceived likelihood of being caught, rather than the formulation of the law itself has the best deterrent effect. Therefore, the act of changing the TV licence offence from a criminal one to a civil infraction should not increase the evasion rate by itself. Behavioural research conducted for the BBC found that if the TV licence was decriminalized and the £1000 fine was replaced by a civil penalty with a fine of £150, evasion rates would increase to 8.9% This, to me, sounds very acceptable considering that the evasion rate, through criminal charges, was higher than that not so long ago. But there is more. If a civil penalty of over £300 was set, evasion rates would stay at 5%. This is amazing news, but what the BBC and the current government want is a 0% evasion, as, deep down, they firmly believe that everyone saying they don’t tune in to the BBC each week is a liar. And this is why they believe a household levy, (i.e. a flat tax forcing everyone to pay for the BBC regardless if they own a TV) would be fairer than the current flat tax that only applies to those who watch live TV. But what they forget, is, short of being a totalitarian state, TV licence evasion is unavoidable. A large portion of Europe, Asia and Africa fund their public broadcasters with a TV licence, in one form or another. Prices in Europe go from £40 per year (Poland) and £255 (Norway). But funding a public broadcaster doesn’t have to be through a TV licence. For example, Andorra, Canada, China, Estonia, Hong Kong, Iran, Liechtenstein, Luxembourg, Monaco, Nigeria, Philippines, Spain, United States, and Vietnam never enforced a TV licence. A substantial amount of countries abolished their TV licence: Australia (1974), India (1984), Portugal (1992), New Zealand (1999), Malaysia and Netherlands (2000), Belgium (2001), Gibraltar (2006), Iceland (2007), Malta and Singapore (2011) and Finland (2013). The UK appears to be the only country, with Ireland, who thinks that non-payment of the licence fee should be a criminal matter. Interestingly, Japanese households with a television set are required to hold a licence, which costs between £75 to £130 per year (the most expensive being for satellite TV), however, there is no fine or sanction for non-payment, though recent conflicting court judgements muddied the waters. 75.6% of people were said to pay the licence fee. The Secretary of State has the duty to review periodically the enforcement of the licence fee. This time, the mandate also included the possible decriminalisation of the licence fee. A TV licence Enforcement Review (also known as the Perry Review), was therefore conducted in the spring and published on the 16th July 2015. The premise was that the BBC offers “value for money” and the bottom line was “if decriminalisation is likely to jeopardise revenues, then the status quo should remain”. Relying heavily on BBC’s response and findings, it concluded that the current system of criminal enforcement should be maintained in the overall public interest. But no study was made of the social impacts of the current criminalisation regime or the outside world’s perception of the British system. In fact, the only recent study used was a behavioural one pre-prepared by the BBC according to their own parameters. The general public was not consulted via an online survey or a street poll and David Perry did not interview a single person who had been recently visited by a TV licence officer or prosecuted by the BBC to ask them what they think of TV licence enforcement methods. Finally, the Perry review recommends that more flexible payments plans be investigated. This ignores the basic problem that money is finite and that some people don’t have enough of it to cover the basics. Saying it’s only 40p a day, or offering different payment option and instalments won’t make a difference if the total stays the same. Another recommendation is that cable and satellite companies should share their customer data with TV licensing. This is a bit rich, coming from a barrister, as Mr Perry should be well aware that it implies a major breach of the data protection act. A petition, called “End the BBC Licence Fee”, hosted on 38 Degrees, calls for a debate on the future of the licence fee, with the hope the TV licence fee will be abolished in the near future. It has already been signed by over 165,000 people and it was translated into Polish and in Malayalam. 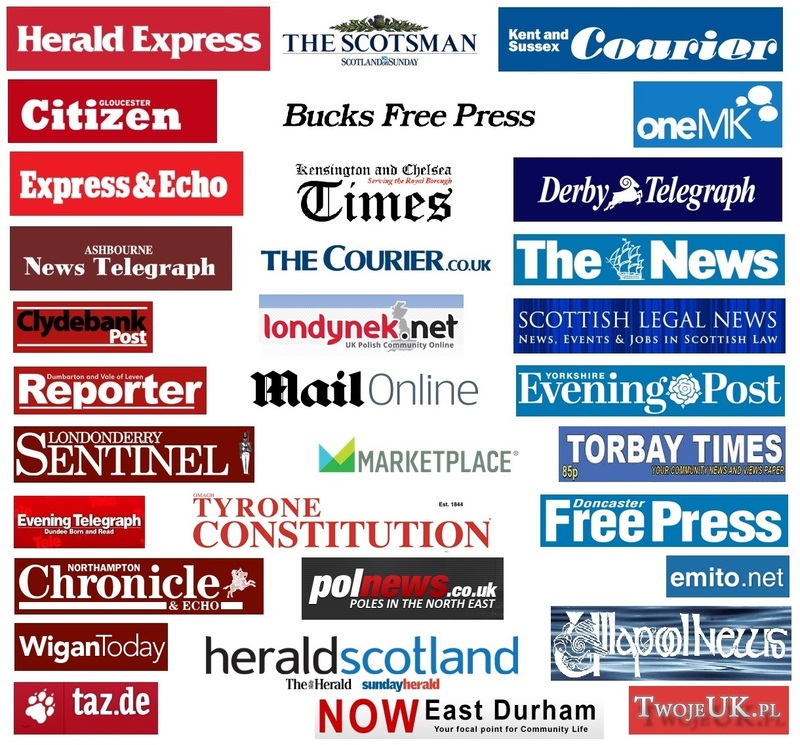 It was mentioned in the national German newspaper Taz and on the American Radio network Marketplace and my research featured in over 20 newspapers across the UK. It’s important to raise awareness on this and to get the TV licence payers involved in the process, for the first time ever. With television licence evasion offences committed in Gwent now being prosecuted in Cardiff (and therefore merged with South West results). This merging of courts means defendants have to travel greater distances in order to defend themselves. It would be fair to ask if this situation makes challenging TV Licensing’s accusations prohibitive. Some local authority areas, including East Dunbartonshire, East Renfrewshire, Midlothian and North Ayrshire, do not contain a sheriff court. As there is no court recorded for police fixed penalties these cannot be broken down to local authorities. Data for Isle of Man has been provided by Information Security, Data Protection and Management of Police Information, Douglas Police Headquarters.